They call themselves "The Goonies." The secret caves. The old lighthouse. The lost map. The treacherous traps. The hidden treasure. And Sloth ... Join the adventure. From the imagination of Steven Spielberg, The Goonies plunges a band of small heroes into a swashbuckling surprise-around-every corner quest beyond their wildest dreams! Following a mysterious treasure map into a spectacular underground realm of twisting passages, outrageous booby-traps and a long-lost pirate ship full of golden doubloons, the kids race to stay one step ahead of a family of bumbling bad guys ... and a mild mannered monster with a face only a mother could love. $9.105 million on -unknown- screens. When The Goonies hit screens during the summer movie season of 1985, I had just graduated from high school. At 18, I probably didn’t fit the exact demographics for which this light-hearted adventure tale aimed, but as a serious devotee of the world of Steven Spielberg, I figured it’d merit a look and probably offer the best flick of the season. No, Spielberg didn’t direct the film himself, but he concocted the story and it came from Amblin, his production company, so I thought it would likely mesh neatly with his other works. Despite the Spielberg imprimatur, however, Goonies didn’t live up to its billing. Although the movie performed decently at the box office, it didn’t dominate the multiplexes, and I also didn’t think it was much of a movie. To be certain, it offered some fun moments, but as a whole I found it to be an excessively cute second-rate action flick. 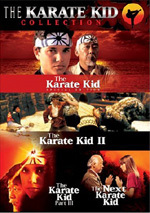 Although the movie wasn’t an enormous hit in 1985, it has cultivated a fairly solid audience over the years, many of whom fondly remember it from their childhoods. As such, I figured Goonies was worth another look many years after the original experience. At the start of the film, we meet a mix of kids who refer to themselves as “Goonies”. The movie attempts some emphasis on a “misfits” theme, but this seems incomplete. Mikey (Sean Astin) is a little fragile medically, mainly because he suffers from asthma, while his older brother Brand (Josh Brolin) seems like he should be a major stud; he’s a hunky dude, and clearly the babes dig him. Granted, he’s mainly a Goonie by association, as the main members are Mikey’s age. Data (Ke Huy Quan) is a wacky wannabe James Bond who creates lots of bargain-budget-Bond devices, while Mouth (Corey Feldman) is an obnoxious, cocky jerk. Lastly, Chunk (Jeff Cohen) provides the stereotypical clumsy and dopey fat kid. All is not well with the Goonies, as a greedy land developer prepares to evict all of their families so a new golf course can cover the land, the area the kids call the “Goondocks”. Unless adequate funds can be raised quickly, this will happen and the Goonies will split as their families leave the area. In preparation for their departure, the mother of Brand and Mikey orders them to pack, and as they check out the attic, they discover a wealth of pirate-related materials collected by their father. Among them sits an apparent treasure map, and though most of the kids regard it as a myth, Mikey believes in the legend of One-Eyed Willy. After they trick Brand - who was charged with Mikey’s care by mom - the Goonies head out to discover the reality of the situation and try to find the “rich stuff”. Along the way, they experience a wealth of adventure, mainly due to their attempts to avoid the evil Fratelli family (Anne Ramsey, Robert Davi, and Joe Pantoliano). Those baddies have already killed to get to the treasure, so they won’t let some stupid kids stand in their way. Before long, Brand catches up with the Goonies, along with Andy (Kerri Green) and Stef (Martha Plimpton), and this expanded pack heads after the loot. From there, the movie follows their adventures as they try to skirt the Fratellis and also capture the money. The story deals with some minor subplots, but for the most part, it simply pushes the Goonies toward their goal, and much action generates from both the threat of the Fratellis and the traps left by pirate Willy. I can see why kids would like Goonies, as it offers a great deal of loose and silly adventure that seems to be aimed at a younger set. That doesn’t mean the film won’t work for adults as well, but I think this is a piece that sits best with the littler ones, especially within the pre-pubescent and early teen demographics. As an adult, I thought it was generally entertaining, but it lacks the cohesion and development to make it more compelling. A lot of Goonies panders a bit too much to the aforementioned audience. The movie features an awful lot of semi-innocent jokes about male genitalia and other bodily functions. Yeah, I know kids in the target age group love that stuff, but that doesn’t mean such a film must include those elements. I think they come across as unpleasant and forced. In addition, Goonies suffers from a cutesy side that the best action flicks avoid. At heart, this is a Scooby-Doo adventure, and the film features a cartoony side that lends itself to semi-patronizing silliness. For example, it includes far too many malapropisms, and some are repeated apparently ad infinitum; “booty trap” ain’t any funnier the 15th time. I also hate the fact the kids always refer to the treasure as “the rich stuff”. How dopey are these boys? That seems like a term a five-year-old might use, but for some early adolescents to blubber about “rich stuff” infantalizes them. Despite these weaknesses, Goonies does offer a generally entertaining experience. Director Richard Donner knows light action flicks. His work ranges from the good to the decent to the downright ugly, but his skills usually come through acceptably well. The Goonies characters are thin stereotypes, but the action set pieces seem to be well staged and fairly exciting, and Donner helps milk the situations for all they’re worth. Goonies features a rather relentless pace, but the adventure never feels too rushed or forced, and many of the pirate-related situations are fun and clever. Overall, The Goonies feels like a kiddie version of an Indiana Jones flick. While it doesn’t live up to those movies, it still has some good moments, and it provides a reasonably compelling experience. I can’t claim that Goonies will ever reside in my list of favorite films, but I enjoyed much of the time I spent with it. One sidenote: The Goonies may offer more goofs and continuity errors than any other movie I’ve ever seen. Frankly, I’m usually terrible when it comes to detecting these, but some of the film’s examples were so glaring that even a buffoon like me noticed them. For instance, in one scene Davi sits at a truck steering wheel and sings. During close-ups, we see him croon, but other shots show him in the side-view mirror, where we watch him smoke and smirk! In addition, the kids mention a non-existent encounter with an octopus at the very end. The latter makes more sense when you check out the disc’s “outtakes”, but viewers of the original film must have felt awfully confused. 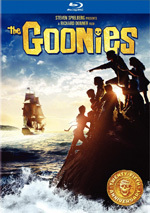 The Goonies appears in an aspect ratio of approximately 2.40:1 on this Blu-ray Disc. Though often attractive, some problems materialized along the way. Sharpness was the only real concern, mostly because a lot of the flick looked rather soft. At times, the flick appeared quite tight and distinctive, but a lot of the movie appeared a bit ill-defined. Some of this may’ve been from the original photography, but I got the impression digital noise reduction affected the situation as well; even in the many low-light sequences, grain was minimal, and the image took on a somewhat plastic appearance that comes with too much DNR. Maybe I'm wrong and the transfer represented the original photography, but I thought it looked like it’d been processed too much, and that created some sharpness issues. Otherwise, the image excelled. I noticed no edge haloes, shimmering or jaggies, and source flaws were absent. Colors were rich and vibrant. The film generally went with a naturalistic palette, and the disc showed these tones with fine clarity and vibrancy. Chunk’s hideous shirt displayed some lively hues, and other clothes and sets also demonstrated nice colors. Black levels were also deep and rich, and shadow detail looked excellent; these offered clean and nicely visible images. As I mentioned earlier, the movie came with quite a few low-light sequences, and I thought they demonstrated good balance and clarity. Parts of the image looked excellent, but the moderate softness made this a “B-“ presentation. On the other hand, I felt very pleased with the Dolby TrueHD 5.1 soundtrack of The Goonies. The mix showed its age at times, but as a whole it provided an active and involving experience. The soundfield favored the forward channels, where I heard a broad and engaging image. Music featured good stereo separation as the movie’s score sounded neatly delineated. Quite a lot of effects came from the side speakers, as the mix added a great deal of discrete sounds from the left and right channels. However, I thought these elements of the track tended to seem fairly “speaker-specific”. Sounds blended acceptably at times, but usually the elements appeared to be stuck a little heavily within the specific channels. The localization was strong, but the bits didn’t fit together as well as I would’ve liked. Surround usage seemed solid for the era. For the most part, the track offered general reinforcement of both music and effects, but a few scenes featured greater activity levels. The action sequences came to life nicely, and some split-surround activity occurred as well; for example, the scene in which the bats flew around the kids appeared nicely realistic and involving. Overall, the soundfield provided good breadth and dimensionality across the channels that seemed superior to the vast majority of films from the period. Audio quality also sounded good, though a few small concerns appeared. Dialogue generally appeared to be acceptably distinct and crisp. Some lines appeared moderately thick and muffled, but these were infrequent instances, as most of the speech provided adequate delineation, and I noticed no problems related to intelligibility or edginess. Music seemed to be nicely lush and vibrant throughout the movie, as John Williams’ score offered solid fidelity. Dynamic range appeared to be strong, and the music showed good depth. Bass response seemed even livelier in regard to the film’s effects. Many elements demonstrated very deep and rich low-end. For instance, an early thunderstorm displayed positive rumbling, and Sloth’s roar really shook the house. Effects also were clean and realistic, and they showed no signs of distortion. Ultimately, the soundtrack of The Goonies was quite strong for an older piece. 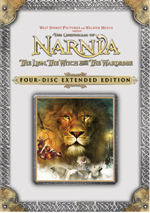 The Blu-ray mixes old and new extras, though all of the disc-based components already appeared on the 2001 DVD. 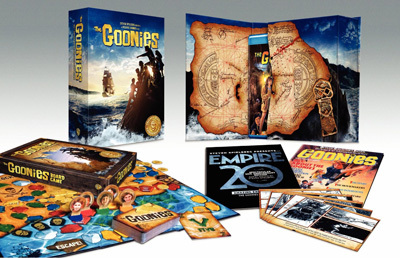 Most significant is an audio commentary from director Richard Donner and all of the “Goonies” themselves. We hear from actors Corey Feldman, Sean Astin, Kerri Green, Josh Brolin, Ke Huy Quan, Martha Plimpton and Jeff Cohen. All were recorded together for this running, screen-specific affair. With some multiple-participant tracks, the proceedings can become rather chaotic as too many people try to speak at once. That problem occurs occasionally during Goonies, but it’s mainly apparent early in the piece; after a few minutes, the eight of them manage to balance their remarks fairly well. Somewhat surprisingly, this commentary suffers from a few empty spaces; that seems odd since it includes so many potential speakers. Some of them come and go as well. Brolin briefly splits to use the can, and Astin completely departs at one point. Nonetheless, the track as a whole seems spirited and entertaining, and it includes a fair amount of information about the film. However, this isn’t the place to come if you desire a wealth of nuts and bolts facts about the production. Instead, Goonies mainly sticks with anecdotes from the kids’ experiences, and many of these are quite fun. Not surprisingly, Feldman seems a little too pleased with himself, and he tries too hard to be witty and irreverent. Otherwise, the group generally falls into a nice rhythm as they enjoy the film and laugh at it as well. Donner largely sits back throughout the piece, and sometimes it doesn’t seem clear that he actually remembers the movie at all, but he chimes in often enough to make his presence worthwhile. In the end, I rather liked this lively little track. According to the disc’s case, the commentary also includes “hidden video treasures”. This means that it occasionally becomes a video program. During a few sections of the film, the movie image shrinks to the lower right corner of the screen as footage of the recording session then dominates. You don’t have to do anything to activate the video segments while you watch the film. Instead, if you select the commentary from the main menu, the footage will appear automatically. This feature remains somewhat gimmicky, but in this case, I thought it was somewhat useful, mainly due to the high number of participants. When heard solely as audio, it could be tough to know who spoke when, and this program helped narrow down the possibilities. It was also nice to see the limited interactions between the members of the panel. The next most significant extra comes in the Outtakes section. These are actually deleted scenes from the film, and we find three of them. Each runs between three minutes, 12 seconds and one minute, 52 seconds for a total of six minutes, 53 seconds of footage. The second clip simply offered a little additional - and fairly unnecessary - exposition, but the others clear up some of the film’s gaffes. Snippet one shows how the map got burned, while bit three offers the famous octopus sequence. These are a nice little addition to the set. The Making of The Goonies provides a 1985 featurette. The six-minute, 49-second piece lacks any real depth about the production as it combines a few film clips with brief interview snippets and shots from the set. The sound bites mainly focus on Donner, but we also quickly see Steven Spielberg and actors Anne Ramsey, Joe Pantoliano and Robert Davi. These are interesting, especially as Donner semi-jokingly discusses working with some many kids, but the behind the scenes images offer the show’s clear highlight. Most of this short piece gives us great shots of Donner as he directs the kids, and they’re a lot of fun to see. Next we find the music video for Cyndi Lauper’s “The Goonies ‘R’ Good Enough”. I didn’t have MTV when this clip bowed in mid-1985, but apparently it ran as a two-part “cliffhanger”. Back in that era, some artists experimented with long-form videos. Michael Jackson’s “Thriller” remains the most famous of these, though I think David Bowie’s “Jazzin’ for Blue Jean” is easily the best. Anyway, “Goonies” fell into that category, as the ambitious piece ran a full 12 minutes, four seconds when both parts were combined. I don’t know how often MTV ran the full program, but rest assured that the disc includes the entire two-part production. The video is a definite relic of its era, as we see a Cyndi-oriented story that echoes the plot of Goonies itself. She and her family run a gas station that may be taken over by nefarious elements, all played by pro wrestlers. However, aided by the Goonies themselves, Cyndi discovers treasures, and along with a surprise guest at the end. In addition to the wrestlers, Steven Spielberg and all the Goonies kids except a mysteriously absent Kerri Green appear in this silly but entertaining clip. As for the song, it ain’t “Time After Time”, but it’s bouncy and catchy nonetheless. In addition to the film’s theatrical trailer, a slew of non-disc-based materials come along here as well. First we find a board game for up to four players. Basically you use “movement cards” to collect dubloons and get your way out of the cave. I didn’t play the game, but it doesn’t look like something with a ton of “fun value”; it might be worth a try, but I wouldn’t expect much from it. Two paper components arrive next. We find a reproduction of the 1985 Souvenir Magazine. In this 64-page piece, we get a lot of photos from the flick and text about the film. Though this maintains a fluffy tone, it still delivers a lot of interesting material; it’s probably the most useful of the package’s non-disc supplements. Another reproduction gives us an Empire Magazine article. From 2009, this takes a “where are they now?” look at Goonies cast and crew that gathers all the participants from the commentary for a new chat. (Producer Spielberg shows up for the photo session but doesn’t chat about the flick.) Of course, we already know what happened to some of these folks, but this is still a nice update. Finally, the set includes 10 Storyboard Cards. Five look at deleted scenes, while the other five examine sequences from the final flick. This information would be better served on the disc itself – mostly because we could then see a lot more storyboards – but this becomes a decent extra anyway. I’ve only seen The Goonies twice since the mid-Eighties, and I must acknowledge that the movie hasn’t aged particularly well. It feels strongly like a piece from its time, but those dated aspects don’t overwhelm the fun and mildly exciting atmosphere that pervades the piece. It’s not on a par with the best action-adventure flicks, but it can be entertaining. As for the Blu-ray, it comes with pros and cons. Audio sounds great, and we get a decent collection of supplements, though all of the disc-based components repeat from the 2001 DVD. Picture quality remains watchable but could be softer than expected. That was my main complaint with this release – along with the price. Goonies on Blu-ray currently comes only as part of an expensive package; all but the most devoted fans should wait for it to come out in a cheaper, disc-only version.